Disclaimer: This guide is massive, so most of it is collapsed by section. Click the spoiler tabs to find the information you're looking for. Disclaimer: Not what you're looking for? Try my Wowhead or Icy-Veins guides for beginner oriented breakdowns. Be part of the team, join the Warrior Discord today! "Arms or Fury in Tomb of Sargeras?" The two are surprisingly well balanced, with the largest differences coming down to choice of legendaries. In practice, encounter mechanics will dictate performance, especially the prevalence of Cleave, burst AoE, and length of the Execute phase. My advice is simple - play what you enjoy. If you like something, you're more likely to invest in it, spend time learning the nuance, and be successful at it. "What's the 7.2 artifact path?" "What are the best Relic traits?" Battle Cry, Enrage, and Raging Blow, regardless of your trinkets or tier. "How do the new traits work?" Pulse of Battle generates 4 rage per critical strike with Raging Blow. Since Raging Blow attacks and can crit independently with each hand, it can generate up to 4-8 rage per crit, and has a greater overall chance for at least one hand to crit. For the mathy types, this means a 10% chance to crit converts to a 19% chance for at least one hand to crit (+4 rage), and a 1% chance to crit with both (+8 rage). Oathblood has a 15% chance to trigger an extra Bloodthirst attack after Bloodthirst is used. It's completely automatic, the damage is rolled separately, generates rage, and has its own chance to crit, which can trigger Enrage. Death and Glory causes Odyn's Fury to deal extra Fire (Odyn's Glory) or Shadow (Helya's Scorn) damage (300% attack power - roughly 50% of OF's direct/non-DoT damage), and either generate 20 rage (Fire) or leech (Shadow). Concordance of the Legionfall is a 50-point trait, which requires all other traits to be obtained first. It's a 10s duration, 1.37 RPPM, Strength increasing proc. "Is T20 better than T19?" Yes; at the same ilevel, with the same gear sans tier pieces, T20 is roughly 4-5% ahead of T19. "What about mixing T19 and T20?" It's doable, depending on your legendaries, but not ideal. Helm and/or Pants are very important to maintaining Enrage uptime with T20, and and while T19 helps with this as well and slightly increases the uptime on Raging Thirst (avg 40-44% uptime), it's dependent on Furious Slash use, while Helm/Pants lead to more Rampage use in place of the weaker Furious Slash. "Is there a BiS list?" Potions: Old War for single target, Prolonged Power for multi-target. PP is roughly equal during Execute if you can perfectly time its duration. The difference between Haste, Mastery, and Strength enhancements tends to be incredibly minor; although AoE slightly favors Str/Mastery, prioritizing Haste is a good rule of thumb, as it will continually help work toward breakpoints (see stats section below), and make up for small changes in gear. "What are the best legendaries?" All rankings change gear as appropriate to maintain tier bonuses. Differences in your own personal gear will affect results. T19 favors Battlelord due to less need for changing gear; T20 favors Helm because it's the weakest tier piece. 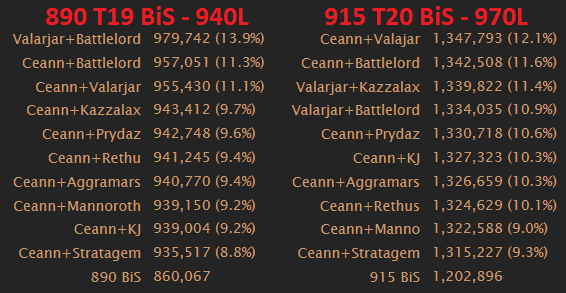 Ceann-Ar and Valarjar are effectively equal for purposes of combinations, trailed closely by Kazzalax and Battlelord. Soul of the Battlelord is more effective on longer Execute phases, and favors Mastery over Haste, so individual gear setups may rank it higher than above. Kazzalax will decrease in value if stacks are not properly maintained. Sephuz doesn't account for the proc; if it can be reliably procced it dramatically increases in value. 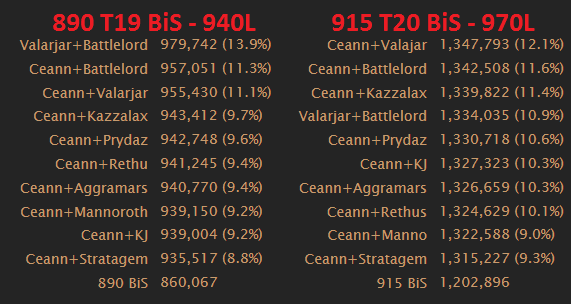 Naj'entus and Kil'jaeden are ranked with only one target; against multiple targets their values increase proportionately. With Kazzalax, Bloodthirst can be used on the pull immediately before Battle Cry to start the stack. With Ayala's, Execute should be used during Raging Blow's cooldown, in place of a weaker Bloodthirst/Furious Slash. Kil'jaeden's should be used during Battle Cry, preferably against multiple targets. It's not affected by Avatar or Enrage and already automatically crits, but does benefit from Unrivaled Strength (which is actually a bug). While strong due to ilvl, it's typically weaker than epic trinkets and other legendaries. The strength of tier-slot legendaries is high enough to outweigh 6p tier combinations of T19 and T20 bonuses. "What are the best trinkets?" Umbral Moonglaives and Convergence of Fates (used in trinket slot #2 for the below simulations). *This is an average drawn from multiple gear setups, which attempts to mitigate stat weight bias, but remember that your own gearing can greatly influence these rankings! This is an example of where "sim yourself" is the right answer. Kil'jaeden's competes against other legendaries, which are typically bigger increases (in other words, if you have better legendaries, don't use KJ). Unstable Arcanocrystal and Chaos Talisman are increasingly difficult to obtain at a competitive ilevel. Specter of Betrayal can deal the highest raw trinket damage, but has strict timing and positional requirements, and cannot be used properly with Convergence of Fates, which hurts Fury more than it gains. It's usable, but well-timed Moonglaives are better. 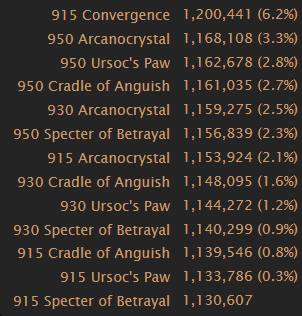 Cradle/Eye of Command will very rarely have 100% uptime in most encounters. 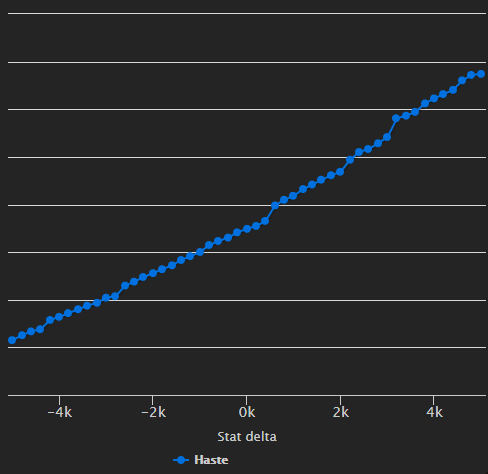 Haste stat sticks can be very strong when approaching notable Haste breakpoints (see stats section below). Umbral Moonglaives fits near perfectly into Battle Cry, making it highly effective on single target as well as AoE. Due to simulation limitations it may sim slightly lower for players with abnormally high or low haste. See the rotation section for notes on use. Convergence of Fates does not require a high ilevel to be effective, although the additional strength is beneficial. Keep in mind that some encounters will require Battle Cry to be delayed, which can significantly devalue the trinket. "How does Convergence hold up in Tomb?" Very well, as long as you aren't forced to delay Battle Cry unnecessarily. However, keep in mind that its power drops significantly if Battle Cry is delayed for any reason. This makes it weaker when delaying cooldowns for adds or important encounter phases. As the tier progresses, more guidelines regarding its use for individual encounters will be presented. The change makes it useable, depending on ilvl and gear useable, depending on ilvl and gear. More information can be found in this post on page 3. I'm pretty sure it's pronounced "delete". "Is Jeweled Signet of Melandrus (auto-attack ring) still good"? Yes, though not as good as it used to be, as Critical Strike is continually devalued in relation to Haste & Mastery and ability damage now makes up a larger part of total damage. "What about Ring of Collapsing Futures?" BiS at a competitive ilvl, though the proc only affects a single target, making it weaker in multi-target situations. It should be used during Battle Cry and Enrage, whenever the Temptation debuff isn't up. "What are the best talents?" Endless Rage should be used on single target fights, while War Machine is better for questing, dungeons, and any raid encounter which grants ~30%+ uptime. For Tomb of Sargeras these fights will be Harjatan, Mistress Sassz'ine, The Desolate Host, and possibly Kil'jaeden. Wrecking Ball is worth using if you're consistently using Whirlwind outside of cooldowns. It's particularly useful against Mistress Sasszi'ine, The Desolate Host, and possibly Harjatan, along with Mythic+. Bounding Stride and Warpaint are interchangeable depending on the need for mobility or damage reduction. "What about the other talents?" Fresh Meat doesn't provided a large enough buff to ensure Bloodthirst critical strikes, or last long enough to impact raid encounters. Shockwave or Storm Bolt can be used, but there are plenty of other classes which bring stuns without opportunity cost. Outburst has very little DPS potential, since Enrage is so easy to guarantee with Rampage and Battle Cry. Furious Charge has some benefit while leveling or chaining solo combat, but isn't practical for group content with healer roles. 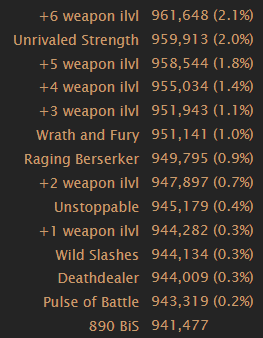 Carnage's 15 rage only saves ~1 GCD, which is minor, and is only active for 80% of the fight. Massacre only works for 20% of the fight, though it can be used in addition to Frothing Berserker with the newest legendary ring. T20 bonuses favor Inner Rage more than Bloodbath or Frenzy. Bladestorm doesn't perform well due to not fitting inside Enrage or Battle Cry, and competing with Odyn's Fury. Dragon Roar is outclassed by Reckless Abandon, and not worth the extra GCD it requires. "My cat started coaching me after I rerolled Demon Hunter, I broke my mousewheel, but got every legendary, and now I'm trying a full crit Frenzy build with T18." Note: > means "greater than", not "and then". This means it's a priority list, not a step-by-step sequence. Note: -> means "and then", not "greater than". This means it's a step-by-step sequence, not a priority list. T20 favors Enraged Raging Blow use ahead of Rampage, due to the potential for extra stacks of the 4p bonus, and more uses inside the 2p proc. T19 favors Rampage inside of Battle Cry and Raging Blow out, though depending on Haste the differences tend to be fairly small without Draught getting in the way. The new legendary pants, Valarjar Berserkers, don't notably influence the rotation either way, outside of simply using Rampage more often. 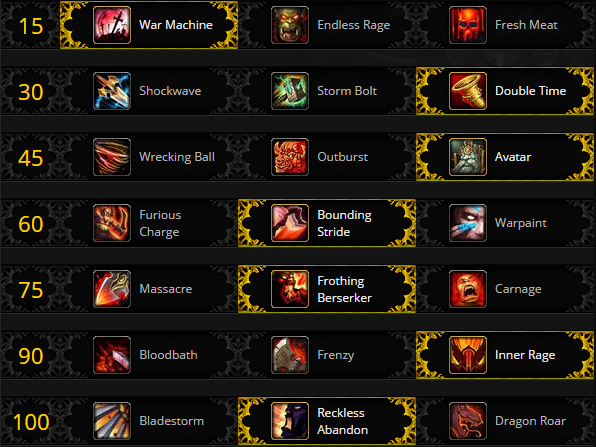 The new legendary ring, Soul of the Battlelord, has its own section on using Massacre, below. This guide will largely cover Tier 20, while the 7.2 guide is still relevant for T19. Cooldowns should be synced as much as possible for maximum burst potential. Potion of the Old War should be used with Battle Cry, Avatar, and Heroism if possible. It is stronger than Prolonged Power, even during the Execute phase. Odyn's Fury is best used after Raging Blow, in place of Furious Slash or Bloodthirst. On-use trinkets should be synced with Battle Cry, Enrage, and Avatar when possible. Umbral Moonglaives should be used 1 second (1 GCD) early to fit the final burst inside Battle Cry and Avatar if talented, similar to Draught. Only use Rampage with 100 rage once the Frothing Berserker buff is up, regardless if you're already Enraged or not. Rampage can be used prior to Battle Cry even with less than 100 rage, to push its last two hits into Battle Cry, and Frothing Berserker will proc anyway. However, you should not delay Battle Cry to ensure either Rampage is used first, or you are Enraged prior to Battle Cry. Increased rage generation from 7.2 traits (Pulse of Battle/Odyn's Glory) and legendaries (Ceann-Ar/Berserkers) can generate enough rage to allow Rampage to be used multiple times during Battle Cry. If already enraged, those extra Rampages should be used after Raging Blow and Odyn's Fury, pushing back Bloodthirst to allow more 4p stack generation, and Furious Slash to eliminate weakness. Best for short Execute phases, wherein the target is expected to die within a few GCDs, valuing the direct damage of Raging Blow over maintaining Enrage/Frothing Berserker. This is the standard Execute build, which simply to spams Execute to build as many Juggernaut stacks as possible before Battle Cry burst, using Bloodthirst and Raging Blow to maintain once rage starved. While not effective at maintaining Enrage or Frothing Berserker, the rotation is simpler than those below, because the rage spending happens on the front end, rather than the back, which eliminates the need for watching cooldown timers or boss health. This can make it more efficient, especially when dealing with unusually short encounters or variable timers such as Convergence of Fates. Odyn's Fury should be used outside of Battle Cry, while rage starved and preferably while enraged, both for damage and the chance of bonus rage generation from Odyn's Glory. For encounters with obscenely short Execute phases, simply use it during Battle Cry as normal (~<5 stacks of Juggernaut). Raging Blow is used in place of Furious Slash, due to the loss of the T19's Taste for Blood buff, for higher direct damage and synergy with Bloodthirst. This means that Enrage uptime drops dramatically, but between Oathblood and Pulse of Battle, Frothing Berserker is very easily maintained at near 100% uptime during the Execute phase. This is currently considered experimental. 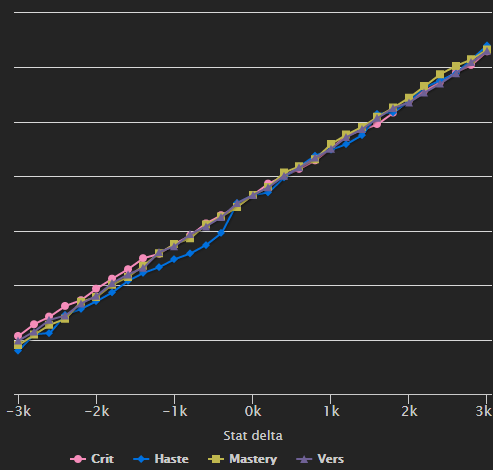 While it works in live practice, the sims dislike it due to the variance in strict timing over several thousand iterations, and ends up with noticeably less stacks of Juggernaut compared to the standard Execute rotation (above). It also requires keen timing, to ensure that the rotation is abandoned and Execute is spammed to maximize Juggernaut stacks prior to Battle Cry coming off cooldown or the targets death, or else damage is wasted. Currently it performs ~0.2-1.5% behind the standard build, which is a fairly small margin, and should narrow or be eliminated upon further iteration. Use Execute to drop rage below 100, Bloodthirst to generate rage, followed by Raging Blow, and then back to Execute. If Oathblood procs and pushes you back up to 100 rage before using Raging Blow, simply use Execute again to drop rage, and continue with Raging Blow and then Bloodthirst. This makes the rotation more reactive than the previous version, but also has better potential for chaining Sense Death inside Frothing, or repeatedly proccing Oathblood/Pulse of Battle to allow Execute to be used more frequently, while Bloodthirst and Raging Blow benefit from their respective tier bonuses. As before, when Battle Cry (or the targets time to die) has ~5-10s remaining, abandon this rotation and simply spam Execute to maximize Juggernaut stacks, before using Battle Cry, followed by Bloodthirst to Enrage. Simply spam Execute, and use Massacre procs whenever Enrage is about to fall off. Three Executes can be used between Massacre with enough Haste, but it can quickly rage starve, and isn't recommended unless Battle Cry is about to come off cooldown. Build extra Juggernaut stacks by spamming Execute ~5-10s before Battle Cry comes off cooldown, though Rampage can still be used immediately prior to Battle Cry for Enrage. Overall Frothing Berserker uptime will be reduced, but Enrage will increase, which is a favorable tradeoff. Frothing will still be applied during Battle Cry as usual. Regardless of which rotation is used above, the cooldown rotation is consistent. Battle Cry will generate 100 rage and proc Frothing Berserker, Bloodthirst/Massacre will apply/maintain Enrage, and fill with Execute. Frenzy has been noticeably less competitive than Inner Rage with T20 bonuses in 7.2.5 testing, but it will be included for completions sake, pending further iteration. Simply spam Execute, use Massacre procs whenever Enrage is about to fall off, and Furious Slash only when necessary to maintain Frenzy. Build extra Juggernaut stacks by spamming Execute ~5-10s before Battle Cry comes off cooldown, though Frenzy should be used before going into Battle Cry if it has <8s remaining, and Rampage can still be used immediately prior to Battle Cry for Enrage. Normal rotation applies, replacing abilities with Whirlwind based on target count. Whirlwind before Rampage to cleave it. Whirlwind in place of Furious Slash, but continue to use Raging Blow to trigger the T20 4p. Whirlwind in place of Furious Slash and Raging Blow. Note: Continuing to use Raging Blow as with three targets will result in only slightly lower AoE DPS, but significantly higher priority target damage. Whirlwind in place of Bloodthirst, Furious Slash, and Raging Blow; continue to use Rampage whenever possible for Enrage. Since Convergence will cause Battle Cry to come off cooldown before Odyn's Fury, they will not be synced. Delay Odyn's Fury for Battle Cry, rather than the other way around. Even with Death and Glory, Odyn's Fury shouldn't be prioritized over Raging Blow. It's better used during Raging Blows cooldown, to replace a weaker Bloodthirst/Furious Slash. Simply put, the gain in using OF over RB is outweighed by the gain in using OF over FS/BT, even if it causes OF to be delayed overall. Because Moonglaives lasts 8s and its strongest hit is at the end, it should be used 1 GCD before Battle Cry, to maximize burst. On the opener, simply use Bloodthirst prior to Battle Cry followed by the normal rotation (optionally, use Furious Slash and then Bloodthirst with Moonglaives to increase Bloodthirst's chance to crit). If Odyn's Glory procs, Rampage can be used a second time in place of Bloodthirst, allowing Bloody Rage to be stacked a second time prior to using Bloodthirst. 1. Use with Convergence, during Battle Cry and while Enraged. This will rarely allow Specter to be double stacked, since Battle Cry's cooldown won't line up with Specters 45s-1m window without significant delay of Battle Cry, devaluing Convergence. 2. Use without Convergence, and purposefully delay Battle Cry to line up with Specter's 45s-1m window. This will yield higher overall results, but only as long as the target never moves out of range. Note: Subject to change based on gear; individuals should always use their own personal stat weights. 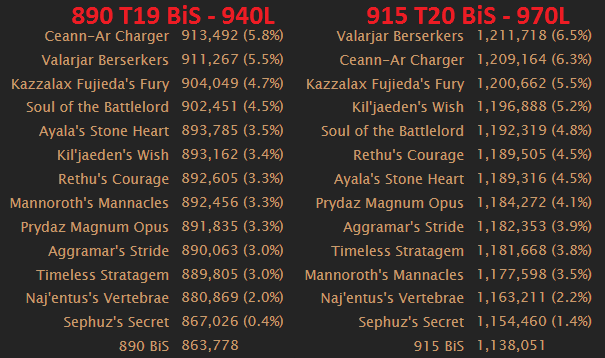 Note: Statistical data is an aggregate of 890-930 ilvl gear profiles with and without various legendaries, trinkets, and all artifact traits up to 10 points in Concordance. While Versatility varies between shallow and competitive and Critical Strike is devalued due to Convergence, Mastery maintains fairly linear growth, and Haste follows a series of breakpoints which drastically inflate its value at various intervals. 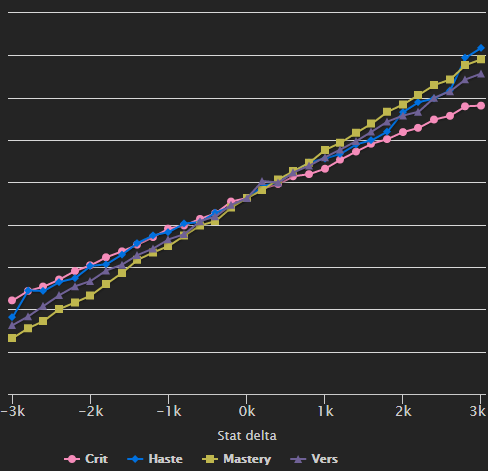 While this may lead you to believe that Haste is only valuable at said breakpoints, this would be incorrect, as even outside of breakpoints, Haste remains close in value to Mastery, constantly dipping above and below it. Keep in mind that this table can be misleading - it's very easy to show one stat (typically Haste) much higher than the others, or have two stats with similar weights constantly change position. To use it effectively, you should re-sim *every* time you change a piece of gear or enhancement. See the next section below. "Should I just sim my own stat weights?" Yes, it's important to understand the general relationship between stats, but when presented with multiple stats with very similar values, stat weights can often be misleading, since a strong weight may not always stay strong. It's arguably more important to understand the trends that stats follow - in Fury's case, Haste tends to be the strongest stat, followed closely by Mastery, unless using the Soul of the Battlelord, in which case Mastery is valued more. This is why "sim your own stat weights to find out which is best for you" is horrible advice - stat weights only show a snapshot in time, and may not project far enough ahead to give an accurate assessment of long-term growth, nor do they account for trading one stat for another. You could very well have stat weights which favors Mastery, change all of your gems and enchants, only to find yourself worse off than before, with Haste as the new top weight. There's a very good blog post on PeakofSerenity about this. Prioritizing Haste will yield the best returns in most situations, as it progresses toward new breakpoints, and tends to remains on par with Mastery. Mastery is the best accompaniment, and can even overtake Haste when using the Soul of the Battlelord, or for burst AoE. Past that, minimizing Versatility and Critical Strike are the most important priorities when evaluating gear, unless they come with a notable ilevel gain, or their own separate bonus. "So what are Fury's breakpoints?" There are a lot of them, actually. The most important ones are ~27% Haste, with another ~50% which is generally out of reach without a large haste buff (Heroism, Frenzy, War Machine). Each of these steps at 17%, 21%, 30%, 37%, 42%, and 50% (values rounded) is a notable breakpoint, with smaller steps interspersed. Remember, breakpoints aren't always as straightforward as "more GCDs during Battle Cry", but can be associated with Enrage, Frothing Berserker, Rage generation, tier bonuses, and so on - meaning your particular gear may shift, add, or remove them entirely. 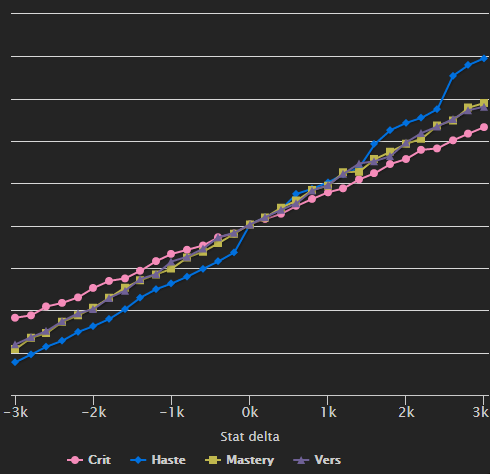 Haste remains on par with Mastery even after hitting individual breakpoints. The Legendary Helm and Pants together collapse some of the lesser Haste breakpoints, due to increased use of Rampage and increased Enrage uptime. At this point Haste and Mastery are fairly interchangeable, though greater breakpoints still exist. The Soul of the Battlelord values Mastery more than haste, due to increased Enrage uptime during Execute, but Haste still has peaks, and is at least equal with Versatility. Keep in mind that the strength of the legendary ring is tied to the length of the Execute phase. Without Convergence of Fates, crit rises dramatically, and provides the best balance of stats overall, though Haste still has notable breakpoints (see left side deprecation), and this balance isn't enough reason to drop CoF altogether. These differing gear setups are examples of why it's good to sim your own stats, to better understand the relationship between them; however, there remains a constant in that Haste and Mastery are universally top stats for Fury, and while other stats gets close, they never really falter. Therefore, the easy rule is to simply prioritize those, and sim gear changes when necessary. "When do I stop getting Haste and start stacking Mastery?" You don't need to, read the goddamn guide! Use at your own risk; individual gear and resulting stat weights won't necessarily match these. Keep in mind that Pawn does not account for bonus effects and can end up misleading unless constantly updating the string after gear changes. There are plenty of other guides on MMO-C and WoWhead covering general 7.2 content, so this is only going to cover Warrior specific interests. Please note that much of this content is time-gated on live, and will be completed incrementally, rather than being available all at once as it was on the PTR. The Class Campaign itself is a very straightforward quest chain available upon completing the Broken Shore introductory quests. Rather than reposting it all here, see my earlier post on the subject (note: some content has since changed and will be noted below as applicable). Rallying Cry is the only real option, as Odyn's Favor does nothing after reaching 110 and has no interaction with world quests. Forced March is the best option for missions, while For Honor and Glory is mainly for fun and flavor. Abundant Valor is far better in 7.2, since high quality Champion equipment can now be obtained much more frequently through missions. Ascension is much better for reaching high mission completion percentages, seeing as Trial By Fire's small bonus is rarely impactful. Spoils of War is incredibly useful early on, although Val'kyr Call can be used once a stockpile of resources has been accumulated (note: it does not work on rare or equip world quests). Legends of Ragnarok is the only option. The choice here is fairly subjective - extra troops help complete bonus rolls, while sending out missions is limited by Champions. I tend to value bonus loot, but it's really 50/50. Legionfall United is the only option. The double trait Relic bonus no longer exists. 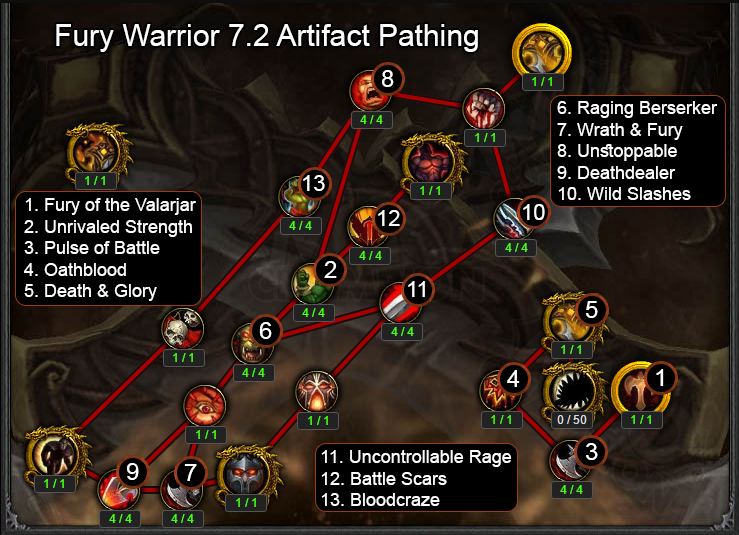 My pre-7.2 writeup can be found here. There's a lot of leeway with regards to composition, and there's no single "best" setup. Mission counters are partially randomized, and your lineup will obviously change if you favor certain Champions or Combat Allies over others. The biggest optimization is simply ensuring you can counter as many threats as possible. That said, this is merely my logic regarding optimal combinations. Unlocking the new follower also unlocks a 6th active champion slot, so you don't have to immediately deactivate a champion to drop back down to 5. Unfortunately, while I want to like them, I don't find the new Champion to be that attractive. Rather than add a 3rd Protection option, we got a 4th Fury, which means overlap and Crowley/Eitrigg has the same counters as the already well-used Hydmall. There simply isn't a lot of reason to use both, so unless you're going to use him as a combat ally, or don't want to use Hymdall, it may be better to deactivate them and use another follower instead - more on this below. Adds two new troops. Like Shieldmaidens, they provide a +30% bonus, but also provide a random counter. While at first glance this seems really attractive, I'm not very inclined to use them, especially if you've trained Abundant Valor, allowing a 4th Valarjar/3rd Shieldmaiden. I find Shieldmaidens on par or better with Ascension, and a lot of counters can situationally be ignored (increased cost, duration, lethal) depending on the mission. Unlocks a 7th active Champion slot, up from 6. I find this to be very useful in allowing more flexibility and variety in countering threats; it's essentially required to allow 2 of each counter, unless you don't want a dedicated Combat Ally. My suggestion is dependent on your level of involvement. If you do missions often, leading to a well developed roster of Champions, of high level and complete with powerful equipment, I find that adding another Champion will make your team more flexible and three extra equipment slots can be far more powerful than extra troops. If you instead do the bare minimum, only sending out missions once per day or less, and don't have all epic/titled quality Champions, then extra troops will be more beneficial for getting high bonus % on the missions you send out. There are many viable setups, largely dependent on who you want to use as a combat ally, and which Champions you may have already leveled/geared up to this point. Weaknesses: Slightly weaker special abilities (Thorim/Ymiron), Crowley is now a much less useful combat ally. Optional allies: Thorim or Hodir can be used as optional combat allies if desired, just swap them when a mission they counter comes up. Strength: Well balanced specs/counters, Hodir is great for world PvP. Weakness: A lot of "solo champion" specials, Hodir is very good for missions. Strengths: Stronger special abilities, Thorim's buff is good for less geared players and in PvP, "KROLMIR!" Weaknesses: Only one dedicated Heroic Leap counter, though Thorim can be used for missions when not actively being used. Weakness: Weaker special abilities; Dvalen. *If you want to use Shocktroops instead of 7 Champions, either drop the dedicated Combat Ally, or drop Ymiron and use Thorim/Dvalen as combat allies to retain the second Arms/Pummel counter. Mostly subjective, but can have a big impact on who you decide to run in your main mission-going roster. Finna - Random proc, 1.5m internal CD. Uncontrollable makes it annoying, often pulls neutral mobs or attacks PvP flagged players (and guards) in towns. Dvalen - Bodyguard. Useful at low levels, but fairly worthless at higher ones. Thorim - 2m CD 3m duration 25% AP buff with a short AoE stun 3m. Good in world PvP, and the buff is a nice ~10% damage increase that can be kept up permanently. Very useful for undergeared players, less useful when you're already two-shotting world mobs. Hodir - 3m CD 8s AoE stun, deals more damage than Thorim, but doesn't provide a personal buff. Very powerful in world PvP. Crowley/Eitrigg - A second combat ally, with the option of putting them in proc mode, working similar to Finna, which causes him to appear and bladestorm a group of enemies for ~500k damage. Personally, I find Thorim and Hodir to be the best allies, because you can control them. I don't really like Finna because she often procs when you don't want her to, and her cooldown prohibits her from appearing when you do (she also procs on and chases non-hostile targets such as neutral mobs and PvP zone/server players not actively engaged in combat). She's also really important for her Pummel, since the other two champions which offer it are, in my opinion, pretty weak. Likewise, I'm not a fan of Dvalen for similar reasons, and I find the extra damage output unnecessary at higher gear levels. Another important thing to remember is that Combat Allies can easily be taken on and off, meaning you can use them for the occasional mission, and so they should complement your group. This can compensate for an imbalanced roster, since you can still use them to complete missions, especially during "off" hours when not actively playing the game. Finna Bjornsdottir - Shield Charge synergizes well with the Shieldmaiden's Ascension, and the strongest option for Pummel. Svergan Stormcloak - Royal Bloodline is strong bonus with the right follower equipment, but requires two open slots for troops, making it difficult to counter missions with multiple threats. Pairs well with Shock Troops. Ragnvald Drakeborn - Commanding Shout has the highest bonus potential of all Champion special abilities. Slightly stronger than Thorim or Svergans bonuses because it still gets some benefit with only one troop and another Champion. Thorim - Titan's Wrath precludes any other Champions on the mission, making it more difficult to counter missions with multiple threats. Pairs well with Shock Troops. King Ymiron - Screams of the Dead is pretty bad in my opinion. A [I]chance/I] to save a 30m cooldown and trivial amount of resources. However, he provides Pummel. Hymdall - Gatekeeper is very useful as the hardest to complete missions are often the longest, and synergizes quite well with long-duration equipment bonuses. Hodir - Frozen Blows is almost always active, since his Whirlwind also counters Minions. Dvalen Ironrune - Enrage is useful though kind of niche; hard to plan on it being available, forces you to counter Lethal, and takes awhile to force availability if it's not already up. While the bonus can stack high, it encourages keeping troops at 1 health, which is at odds with Ragnvald/Crowley/Rallying Cry which benefit from high health troops. However, he provides Pummel, and is typically a better option than Ymiron. Darius Crowley/Eitrigg - Leader of the Pack/Blood and Honor is disappointingly the same effect as Ragnvald, although it is one of the stronger bonuses. His true fault is that his counter also copies Hymdall's, who is likely far more useful as a "long mission" specialist, and likely already well developed during the time leading up to 7.2. Meatball & Moroes - Both are great champions, and can be really useful for hitting 200% with underdeveloped teams, but the downside is that they don't actually counter anything. Personally, I don't have much problem hitting 200% as long as I can counter the missions... the hard part is actually having whatever combination of counters it requires, which is why I favor regular champions. TLDR: Meatball & Moroes allow you to 200% one mission - having a wide range of counters allows you to 200% many missions. If you do want to use them, my suggestion would be to use only one, either as a combat ally, or using your combat ally to cover any counters that you lose by replacing one of your primary mission going champions. I tend to find Finna, Hymdall, Ragnvald, Hodir, Svergan, and Thorim the most useful due to their bonuses, while Dvalen and Ymiron the least, in that order. Since we're going for an extra Protection and Pummel, there really isn't a lot of choice - Svergan is the only choice, and unfortunately, getting a second Pummel counter requires the use of either Dvalen or Ymiron. Although Dvalen's special ability is better than Ymiron's, there are already too many good Fury picks, so Ymiron wins out in the end. This is why I find Roster of Champions more useful than Shock Troops - you can't get two of every spec/counter and have a dedicated ally without it. Although you could get by with 6 and a "flexible" combat ally used part time, I still favor an extra Champion, as it allows more variety and a greater chance of being able to counter missions. As I said in the beginning, there's a lot of flexibility, and I don't really think there's any "right" choice as long as you can counter mission threats. The biggest influence is who you decide to take as a Combat Ally, and which Champions you may have already spent time leveling up/equipping already. I'm currently using setup B. Even more so than the Champions themselves, there's an incredible amount of leeway, the only real rule is to play to the Champions strengths. Basically Hodir is my short mission specialist (can knock 5hr missions below 4hrs by himself), while Hymdall primarily deals with long missions. Finna and Ragnvald boost both roles due to their limited class counters; Svergan and Dvalen are built for troop bonuses, and Thorim is a primary combat ally only used for throwaway missions and the rare extra Arms counter. Requires completion of a scenario, quest offered by Odyn, after finishing the Class Hall Campaign and Breaching the Tomb of Sargeras. Or you can just collect extra Valarjar rep and farm for the real Warrior class mount. Naeno has already written an excellent overview of the fight, so rather than regurgitating it, I suggest taking a look at it for general advice. While the basis of the strategy most players are using revolves around out dpsing her Imp Servant's heal, which requires quite a bit of gear, hard swapping and killing them immediately requires just as much gear to not get overrun, so I really don't think one way has a lower gear requirement than another. Remember, this content is meant to last the majority of 7.2 for most players - not everyone is meant to complete it the first week of the patch. Although I had a series of sub 10% wipes, I got pretty lucky with the timing of her abilities on the kill, so although the fight is mostly scripted, there is an element of RNG and some variance within her phases. If you feel as though you're doing everything correctly, but just getting stomped by certain combinations during the fight, I suggest trying to pushing her phases at a different time than normal. You can also find a more comprehensive step-by-step guide to the scenario in my WoWhead guide. The fight is all about control; while the high DPS requirement makes it feel like a DPS race, it's actually a survivability one. You're better off saving cooldowns to deal with her adds (Umbral/Scorching Imps), rather than trying to simply burn her health down quickly. There's no enrage, so if you handle the adds well, you'll take less damage, and can keep the fight going as long as need be. I didn't even realize I killed her on my kill, being so focused on dodging mechanics, her defeat took me completely by surprise. Drums reset with each attempt now, though I still found them better to use during the latter portion of the fight - if you can't make it through Phase 1, you're not going to make it through Phase 2 anyway. Kiting the Fuming Imps with Piercing Howl is a valid strategy, though I found it more difficult due to losing GCDs, and often requiring me to kite away from the adds I was trying to kill. Ideally, you'll stack all of the Fuming Imps void zones atop one another to the side or under the boss. Pummel will sometimes not interrupt her channel, even if her shield is down. I haven't looked into the cause, though I believe I only ever saw it happen during phase 1. I'd recommend at least 900 ilvl equipped. It can certainly be accomplished with lower, but it will be increasingly more difficult to meet the damage and survivability checks. Talents - Shockwave/Wrecking Ball/Warpaint are alternatives, but I found that the adds were rarely grouped well enough to stun more than one or two at a time, and focusing on killing extra targets within cooldown windows emphasized the use of Furious Slash (with T19 4p tier) rather than Wrecking Ball-Whirlwind spam. Spiced Wildfowl - Not incredibly important, but works pretty well due to the high mobility requirement and frequent adds. Prydaz, Xavaric's Magnum Opus is ideal, as it's shield can save your life if you're hit by a stray boulder, leave her shielded too long, or allow too many Imps to stack up. Mannoroth's Bloodletting Manacles are key in allowing you to recover from mistakes. Prydaz will keep you alive, but you'll be in a vulnerable position until it comes up again, while Mannoroth's extra healing will allow you to heal up quicker. Naj'entus's Vertebrae seems good, though I don't think I'd recommend it. Done correctly, the strategy revolves around bursting down groups of adds during cooldowns, outside of which you shouldn't need to be Whirlwinding much. Kil'jaeden's Burning Wish is a great option for taking out groups of Imps quickly, though I don't think it's required, and given the option would probably favor defensive legendaries instead. Gronntooth Warhorn - While the trinkets stat increases are underwhelming, the extra damage against demons applies to all targets within the scenario. Certainly not required, in fact there's a lot of leeway with regards to trinkets. Draught of Souls - Viable option, though I'd suggest not using it with cooldowns (aside from the opener), and using it to quickly pop her shield instead. Convergence of Fates - Also not required; Battle Cry is best saved to handle large groups of adds rather than used on cooldown, though Convergence allows it to be used a bit more frequently which helps break her shield, especially if not also using Draught of Souls. You will need to have a good understanding of the fights timing to use it effectively. As always, this guide is a living document; updates and beautification are an ongoing process. Last edited by Archimtiros; 2017-07-09 at 07:05 AM. Thanks Archi, as always, keep up the great work! You have any thoughts on what to do if they kill convergence? "Specter of Betrayal can deal the highest raw damage, but has strict timing and positional requirements, and cannot be used with Convergence of Fates, which ultimately hurts Fury as much as it gains." then nerf the value of BC relic a bit and i think that's about it. Thanks for your work, really appreciate it! Cant find Ceann+Kazzalax on the right, why? It was mislabeled (Valarjar+Kazzalax = Ceann+Kazzalax), and has already been fixed. Use another trinket, there are plenty competitive ones to choose from. Great guide as always! Question: does the T20 devalue the WW belt on 3 targets? Since you buff BT damage with RB and you used to forgo of casting RB with the WW Belt. Slightly, but it's still the best multi-target legendary for direct damage, and you still use WW over RB at higher target numbers. I understand where you were going with this, but this is going to cause confusion for a lot of people that are just looking for a simple answer. The two sections are making different points, though perhaps the problem is that "sim" is a colloquialism which can be inferred in multiple ways. In the first section, the point is that stat weights can be misleading when two stats have a very close relationship with one another. Specifically referring to Haste and Mastery which naturally intertwine and "leapfrog" one another; if someone asks if Haste or Mastery is better, simply telling someone to sim themselves and let their weights decide won't do much good if the stats flip every time a piece of gear is changed. In the second section, the point is that simming is still useful to give you an idea of how the stats relate to one another when you're changing gear. Convergence of Fates is used as the example, due to how significantly it devalues crit, while without it, crit rises to the point of becoming a very competitive stat. I can see how this might sound contradictory, but it's supposed to show contrast - stat weights aren't useful if you simply sim and forget, but they can help you understand how important pieces of gear such as legendaries and trinkets impact those stats. It's also why I bracketed those sections with guidelines as to how to prioritize stats, so that those players who aren't interested in the nuance can simply read the priority and move on. Last edited by Archimtiros; 2017-06-12 at 05:20 AM. While Versatility varies between shallow and competitive and Critical Strike is devalued due to Convergence, Mastery maintains fairly linear growth, and Haste follows a series of breakpoints which drastically inflate its value at various intervals. 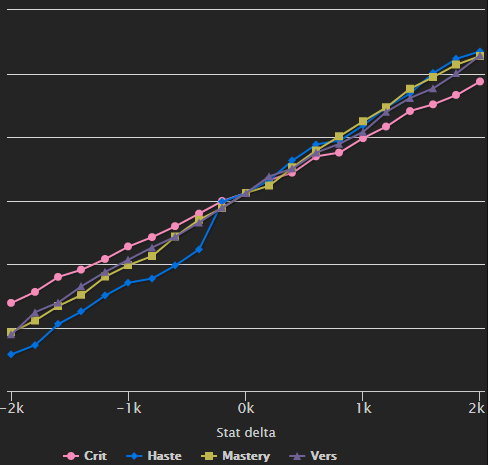 While this may lead you to believe that Haste is only valuable at said breakpoints, this would be incorrect, as even outside of breakpoints,Haste remains close in value to Mastery, constantly dipping above and below it. Archi did u do sims for the case CoF gets out of the picture? That trinket will still be good for some classes as it is right now, not just fury, and judging by how blizz nerfed it by 70% for rets in 2nd day of Nighthold release, wont surprise me that a hotfix will get trough before mythic ToS gets launched. Keep up the great work fam! Just throwing it out here in case you haven't thought about it yet though i'm sure that you already have. 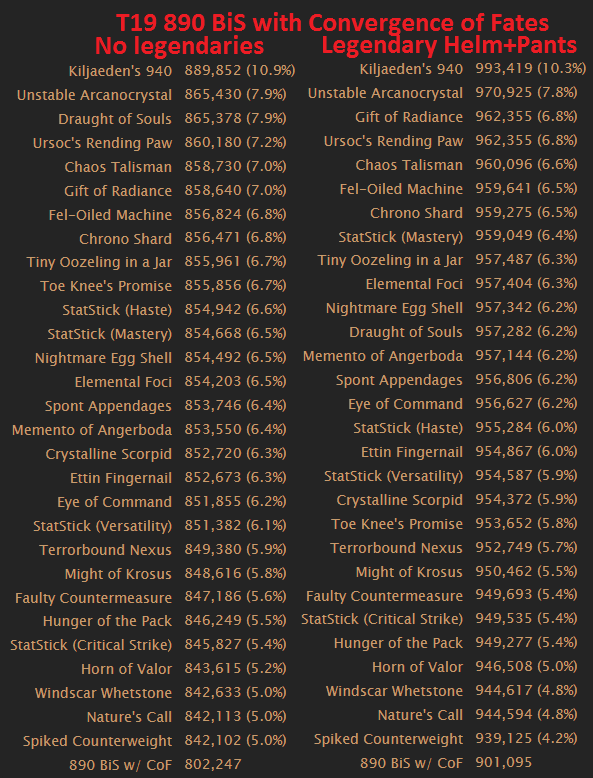 Would running tier legs + the good stat gloves from fallen avatar instead of that tier piece and finally running soul of the battlelord instead of one of the harjatan/maiden rings provide higher numbers given the better itemization you'd end up with be worth it despite the slightly weaker legendary effect? Looking at the guide in depth i think this might be the case but i wouldn't presume to know better than you. edit: now that i thought on it some more i assume that the valarjar berzerkers would be used given that it's a legendary item in the leg slot which gives it more primary and bonus stats by comparison to its item level so it makes sense. Last edited by Morgaith; 2017-06-12 at 04:22 PM. Thanks Arch. Great work as per usual. I am slightly confused with this rotation explanation. To clarify, in an ideal situation, I would already be enraged before using Battle Cry. This would mean that I am using BC and RB at the same time, then following the priority list above. However, if I am not enraged, since we don't want to delay BC, I would want to BC+Rampage and then follow the priority list again? You mention pushing the last two hits of Rampage into Battle Cry. Are you suggesting that we would be casting BC during the middle of Rampage, or that we would simply be clipping the rampage swing with BC+RB? I hope my questions make sense. Thanks. Yes, I have them prepared. The only important change is crits value increasing to match Vers. Personally I don't think CoF will be nerfed - if it were going to be, we'd have heard about it by now. Unlike Draught, it's a trinket which can easily fail if you're delaying BC either unintentionally, or intentionally due to fight mechanics, and it doesn't have the same visibility issue that Draught did (high burst on one button that shows in the damage meters as all your damage coming from one trinket). I'm sure that if we're still using it by the time 7.3 raid tier rolls around, they'll do something about it, but so far there's been no hints of it being nerfed. 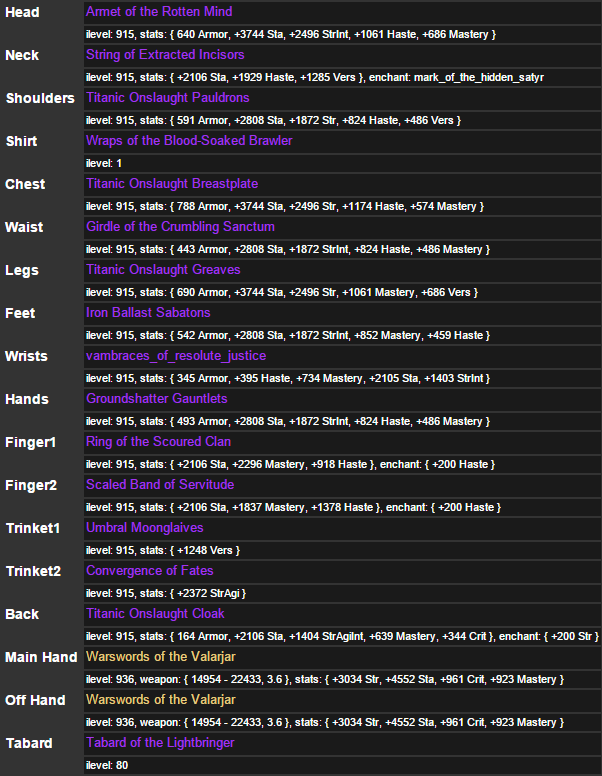 That's what the BiS profile does by default; the legs/gloves are swapped out as needed for legendaries. In other words - the legendary rankings linked above do exactly what you're asking. The ring is mostly limited by the length of the Execute phase. For new raid tier sims I usually run both 300s (5m) and 450s (7.5m), since those are good encounter averages and look for differences in the results. The ring tends to dip lower on shorter Execute fights (5m), and slightly higher on the longer ones (7.5m+). Ultimately, it'll be dependent on how long the Execute phase is, and the probability of dropping Juggernaut (due to Maiden phase movement, etc). Archi; quick question regarding trinket values. 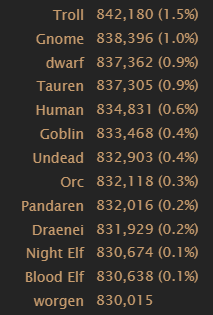 On AVERAGE how much do you find % increase on a trinket is per 5 ilvl? Example: You have 900 chrono shard vs a 905 chrono shard. or 900 arcano vs 905 arcano. Or does this really vary depending on trinket? If you could could give a blanket % what would it be?